This is what Piksteri sent me from Finland. 200 gr. of Kamena by Teetee and 200 gr. 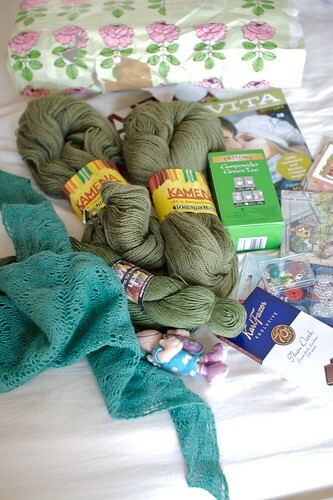 of hemp yarn from Hemp fo Knitting, both in great shades of green. The first will probably become a shawl, while I was thinking about a market bag for the second (maybe Elisa Nest Tote). She really spoiled me and I love the yarns she chose for me! I hope she'll enjoy my package as I did for hers.